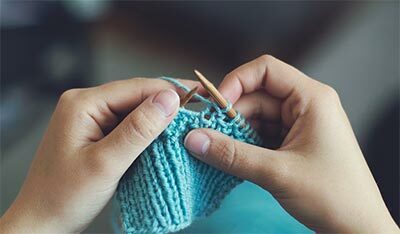 Knit-Out & Crochet events were started in 1998 by the Craft Yarn Council of America (CYCA) with the help of volunteers to bring knitting, crocheting and yarn crafts to the public's attention. Now large and small groups and guilds nationwide are sponsoring Knit-Outs. Knit-Outs can be as informal as a group getting together in public to knit or crochet or large gatherings with a variety of activities. 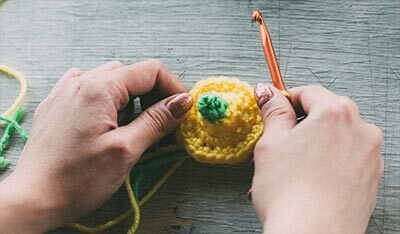 Interested in volunteering to teach or helping out at a Knit-Out & Crochet event? Contact Craft Yarn Council or see address below. Yarn enthusiasts from around the country, novices along with seasoned knitters and crocheters, joined the throngs of Mall visitors over President's Weekend at the Knit-Out & Crochet 2009. Despite long lines at booths that lined the East and South corridors of the Mall, visitors waited patiently to see the latest in yarns, designs and accessories being exhibited and to take advantage of the giveaways. The Mall estimated that the crowd swelled to 50,000, which equals last year's attendance. It's always difficult to say what were the biggest crowd pleasers. For first timers, it was the Learn to Knit/Crochet areas where volunteers from the Minnesota Knitters Guild taught them how to get started. Each received their first set of needles or a hook, along with yarn and instructions to take home. Others crammed the demos to learn new techniques. Debbie Macomber fans were delighted to have an opportunity to meet her and to listen to her personal stories about knitting. Debbie also serves on the Board of Directors of Warm Up America! and urged knitters and crocheters to help the Foundation meet its goal of distributing 10,000 afghans in 2009. Debbie was also interviewed by Knitting Daily editor Sandi Wiseheart for the Authors' Forum, along with authors Edie Eckman, Margaret Radcliff and Judith Durant. For the first time, there were Super Seminars, 2-hour classes with Annie Modesitt and Barbara VanElsen. People enjoyed these in-depth classes and an opportunity to get off the busy Mall floors. Area kids thronged the Krafty Kids booth, hosted by the Washburn County, WI 4-H knitting club. Of course, the stage in the Mall Rotunda was hopping throughout the two days. Crowds gathered for three fashion shows hosted by Knit Simple Editor Carla Scott, Knitter's Rick Mondragon and Crochet Today editor Brett Bara. While the adult fashion show previewed more than 50 exquisite knitted and crocheted garments, it was the kids and dogs that stole the runway. Not to be outdone were the wonderful knitters and crocheters who shared their favorite projects during the Show & Share segment, hosted by Steven Berg from the Yarn Garage. Thousands came to learn and to see what was new but they also came to be with other yarn enthusiasts. And they are asking for more spaces and places to just sit and knit and crochet. Increasing Knit-Out is becoming a meeting place. To our amazing Steering Committee: Annette Bjorklund, Bonnie Johnson, Georgia Thometz, Louise deGeus, Pam Hodges, Patsy Fisk, Shelly Britton, Steven Berg and Terry Ann Porter, as well as to all the terrific volunteers who spent hours teaching people how to knit, crochet or answering questions, you are all wonderful. From all the members of Craft Yarn Council of America, our sincerest thanks for helping us to make this a year's Knit-Out the best ever.